Then why don’t you pop down to this pop-up in Covent Garden which is there for a limited time and get your face made out of chocolate with a dusting of gold. If you don’t get a chance or missed the event then you can order online. Fun, unique, interesting and delicious. To create and buy your own Lolpop click here. 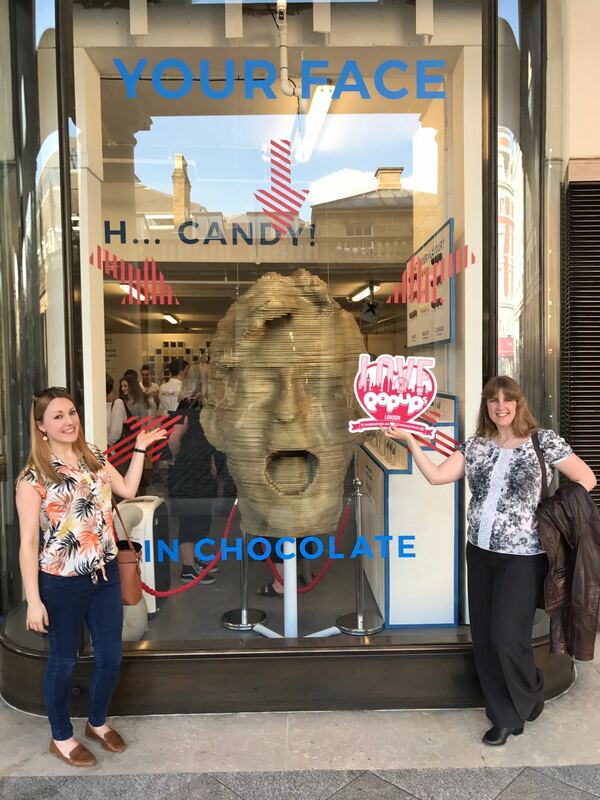 Thanks to Lolpops who let some of the community of Love Pop Ups London come down to have our face’s made out of chocolate. Read all blogs/reviews from below. For just 5 days Candy Mechanics have opened a pop-up in Covent Garden to showcase the most innovative thing to happen to chocolate since the Crème Egg! Candy Mechanics is a booming online business which offers chocolate gift cards as well as the opportunity to have your face carved in chocolate. They are also available for events – imagine this at your next Christmas party?! Not only does the concept truly have the wow factor it also tastes DELICIOUS. Lollipops are available in white, milk or dark chocolate, finished with gold shimmer and presented in a box. Although it is insanely impressive and quite time consuming it still comes in at a whopping £8 for each lollipop (and they are quite diddy!). Go for the milk chocolate – the shimmer accentuates the features better than the white and the dark chocolate doesn’t carve as well. Girls – make sure if your hair is down you bring as much over your shoulders as possible with no hair tucked behind your ears (honest it makes for a scary lollipop! ).